All values are classified by types that are classified by *0. All types are classified by kinds that are classified by *1. 2. 所有的 instance 都來自某個 class. 所以當然也會有 parent. 沒有 parent 的，只有 instance. class hierarchy 最直接影響到的，當然就是 method dispatch. override 其他所有的 method. 因此，他必然得是第一個被 lookup. (其實是 meta-class) 的 instance method. 但是其實 Human 的 class 並不是真的 Human 的 class. 因為 Fixnum 與 Human 同樣都是 Class 的 instance!! class method, 也可以是 derived-class 的 class method. 那麼，MetaMutant 的 parent 就會是 MetaHuman. 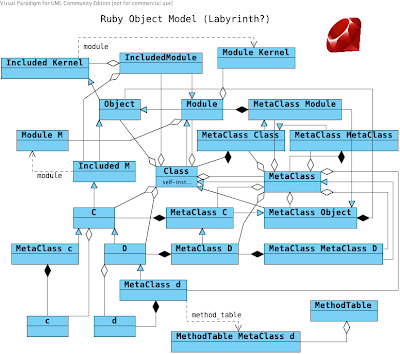 而 MetaMutant 就是 MetaClass D.
這邊就是 class 層級的 object model. 沒有 OST 喔，ZUN 只有出一些 collection.